Figure 6-8. Coupled ailerons and rudder. Figure 6-9. 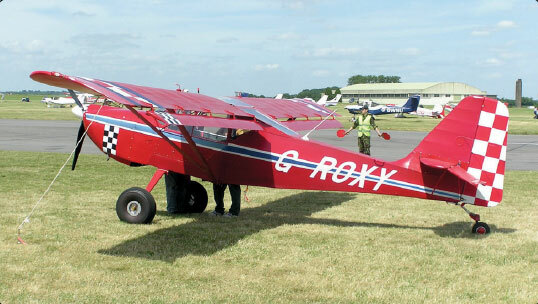 Flaperons on a Skystar Kitfox MK 7. Figure 6-10. 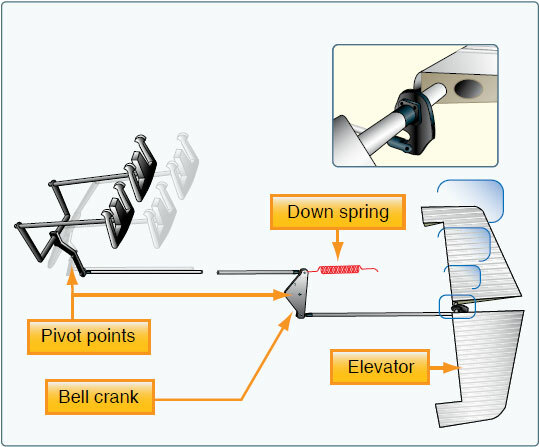 The elevator is the primary control for changing the pitch attitude of an aircraft. 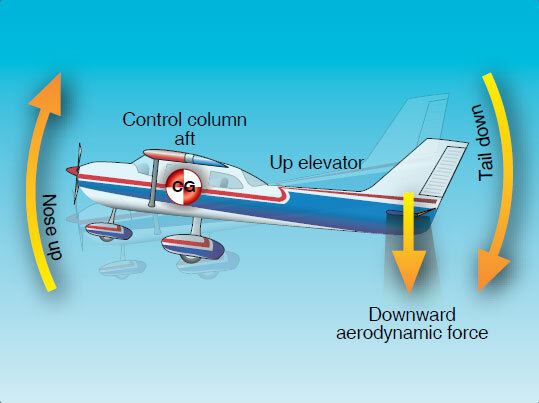 The up-elevator position decreases the camber of the elevator and creates a downward aerodynamic force, which is greater than the normal tail-down force that exists in straight-andlevel flight. 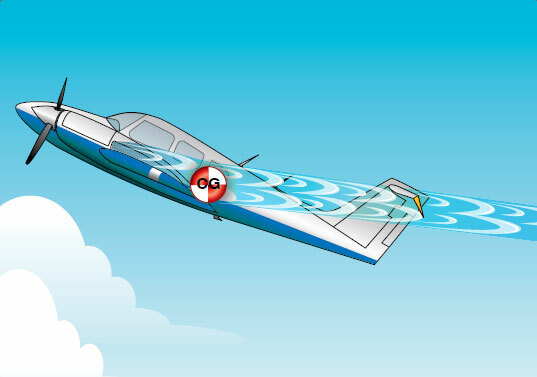 The overall effect causes the tail of the aircraft to move down and the nose to pitch up. The pitching moment occurs about the center of gravity (CG). The strength of the pitching moment is determined by the distance between the CG and the horizontal tail surface, as well as by the aerodynamic effectiveness of the horizontal tail surface. Moving the control column forward has the opposite effect. In this case, elevator camber increases, creating more lift (less tail-down force) on the horizontal stabilizer/elevator. This moves the tail upward and pitches the nose down. Again, the pitching moment occurs about the CG. As mentioned earlier, stability, power, thrustline, and the position of the horizontal tail surfaces on the empennage are factors in elevator effectiveness controlling pitch. For example, the horizontal tail surfaces may be attached near the lower part of the vertical stabilizer, at the midpoint, or at the high point, as in the T-tail design. 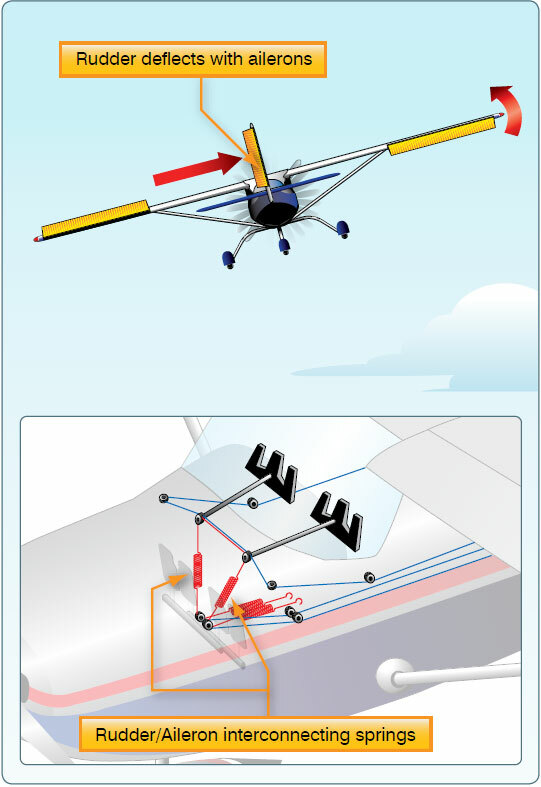 In a T-tail configuration, the elevator is above most of the effects of downwash from the propeller, as well as airflow around the fuselage and/or wings during normal flight conditions. Operation of the elevators in this undisturbed air allows control movements that are consistent throughout most flight regimes. T-tail designs have become popular on many light and large aircraft, especially those with aft fuselagemounted engines because the T-tail configuration removes the tail from the exhaust blast of the engines. Seaplanes and amphibians often have T-tails in order to keep the horizontal surfaces as far from the water as possible. An additional benefit is reduced noise and vibration inside the aircraft. In comparison with conventional-tail aircraft, the elevator on a T-tail aircraft must be moved a greater distance to raise the nose a given amount when traveling at slow speeds. This is because the conventional-tail aircraft has the downwash from the propeller pushing down on the tail to assist in raising the nose. Aircraft controls are rigged so that an increase in control force is required to increase control travel. The forces required to raise the nose of a T-tail aircraft are greater than the forces required to raise the nose of a conventional-tail aircraft. Longitudinal stability of a trimmed aircraft is the same for both types of configuration, but the pilot must be aware that the required control forces are greater at slow speeds during takeoffs, landings, or stalls than for similar size aircraft equipped with conventional tails. T-tail aircraft also require additional design considerations to counter the problem of flutter. Since the weight of the horizontal surfaces is at the top of the vertical stabilizer, the moment arm created causes high loads on the vertical stabilizer that can result in flutter. Engineers must compensate for this by increasing the design stiffness of the vertical stabilizer, usually resulting in a weight penalty over conventional tail designs. When flying at a very high AOA with a low airspeed and an aft CG, the T-tail aircraft may be more susceptible to a deep stall. In this condition, the wake of the wing impinges on the tail surface and renders it almost ineffective. The wing, if fully stalled, allows its airflow to separate right after the leading edge. The wide wake of decelerated, turbulent air blankets the horizontal tail and hence its effectiveness diminished significantly. In these circumstances, elevator or stabilator control is reduced (or perhaps eliminated) making it difficult to recover from the stall. It should be noted that an aft CG is often a contributing factor in these incidents, since similar recovery problems are also found with conventional tail aircraft with an aft CG. [Figure 6-11] Deep stalls can occur on any aircraft but are more likely to occur on aircraft with “T” tails as a high AOA may be more likely to place the wings separated airflow into the path of the horizontal surface of the tail. Additionally, the distance between the wings and the tail, the position of the engines (such as being mounted on the tail) may increase the susceptibility of deep stall events. Therefore a deep stall may be more prevalent on transport versus general aviation aircraft. Figure 6-11. Aircraft with a T-tail design at a high AOA and an aft CG. Since flight at a high AOA with a low airspeed and an aft CG position can be dangerous, many aircraft have systems to compensate for this situation. The systems range from control stops to elevator down springs. On transport category jets, stick pushers are commonly used. An elevator down spring assists in lowering the nose of the aircraft to prevent a stall caused by the aft CG position. The stall occurs because the properly trimmed airplane is flying with the elevator in a trailing edge down position, forcing the tail up and the nose down. In this unstable condition, if the aircraft encounters turbulence and slows down further, the trim tab no longer positions the elevator in the nosedown position. The elevator then streamlines, and the nose of the aircraft pitches upward, possibly resulting in a stall. Figure 6-12. When the aerodynamic efficiency of the horizontal tail surface is inadequate due to an aft CG condition, an elevator down spring may be used to supply a mechanical load to lower the nose. The elevator must also have sufficient authority to hold the nose of the aircraft up during the roundout for a landing. In this case, a forward CG may cause a problem. During the landing flare, power is usually reduced, which decreases the airflow over the empennage. This, coupled with the reduced landing speed, makes the elevator less effective. As this discussion demonstrates, pilots must understand and follow proper loading procedures, particularly with regard to the CG position.